Tim Kasher's (of Cursive) latest project, The Good Life, is a nighttime, starry-eyed pop record rivaling the tranquil beauty of the night sky, lit up by the moon and stars, whispering in your ear, and allowing you to feel free for while. The songs are pretty, whether they're wrapped around a rock guitar riff and steady drum rhythms or soft, raindrop-like guitar and faint percussion. The lyrics engage you as Kasher's voice calls you in with its sweet, early morning breeze and late night caffeine buzz stagger. 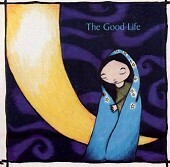 The complete package is one that will find you entangled in the songs, sucking up every last drop as you just lay there, so peaceful and happy, enjoying the beauty and soothing-ness of The Good Life. I'll give it an A.